The Magnolia Roads American Roots Hoedown IV is just around the bend! 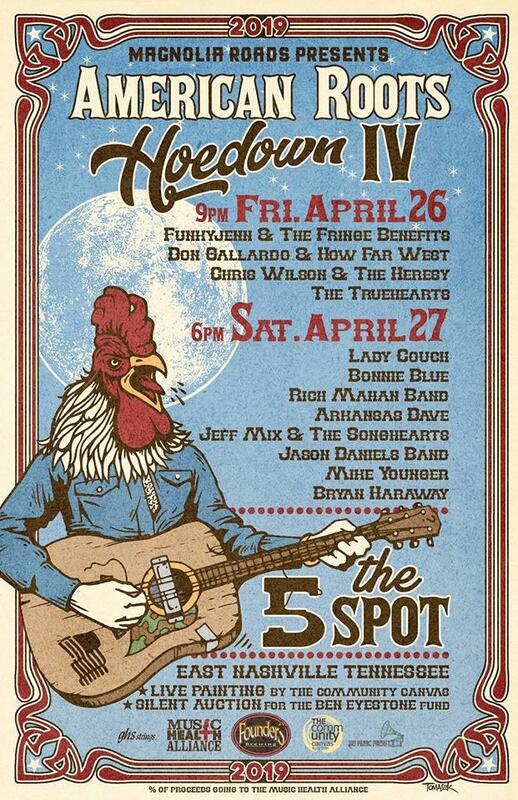 Make your plans to attend Friday April 26 and Saturday April 27 at The 5 Spot in East Nashville. The fabulous Lady Couch will be closing out the whole she-bang on Saturday! Here is a video of Allen Thompson and Mike Ford of Lady Couch. Now, we have come to the last Shuffle for this week. I am off work tomorrow for Good Friday. You know, I may need to rename my Wild Wednesday shuffle - because to be honest our regular shuffles have been pretty wild and pretty awesome. Thanks go out to the artists and publicists who continue to send me great and diverse new (and reissued) (and new to me) music. 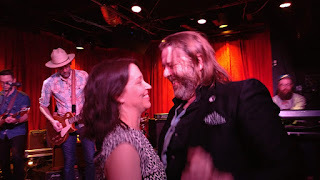 Today another reminder about the Magnolia Roads American Roots Hoedown IV - happening next Friday and Saturday April 26 and 27 at The 5 Spot. If you are on Facebook, go head and mark that you are GOING. Here's the Event Page. Now, it is Wednesday and time to dive right into the Wild Wednesday Shuffle. I believe this one lives up to the name. New songs, classic songs, and who knows maybe some new classics. As fate would have it, I added some music to the Trending Playlist last night, and the final count of songs came in at exactly 500 (which is the max I set for the playlist). Anyway, I'm kind of slammed with things - so let's get right to the shuffle. It is now less than two weeks until the Magnolia Roads American Roots Hoedown IV. As part of this year's hoedown, there is a silent auction - which is going on now. There are several amazing items up for bid, and you do not have to be present at the Hoedown to participate or win. HERE is the link to the on-line auction. Remember all proceeds go to the Ben Eyestone Fund at the Music Health Alliance. So get bidding! Now, we head back into the Music City Monday shuffle. It was a good one! Today, I would like to talk about the fund raising part of the Magnolia Roads American Roots Hoedown IV. As I have mentioned, the show and the silent auction will benefit the Ben Eyestone Fund of the Music Health Alliance. Many of my Nashville readers know about Ben and this fund, but for those reading this who don't know, HERE is a link to some information about the fund. I feel like this is becoming a pattern, but it has been another rough week, and I am so glad it is Friday. As I mentioned yesterday, I did add a bunch of new music to my playlist, and I did have to make some cuts to get down to 500 songs (which I have arbitrarily set as a limit for this playlist). Those songs removed are still on my phone, so they can show up on a future Wild Wednesday shuffle. 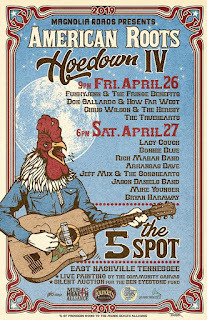 It is just over two weeks until the Magnolia Roads American Roots Hoedown IV (April 26 and 27) at The 5 Spot. I am excited to officially announce that I will be acting as Co-MC for this mini-festival. 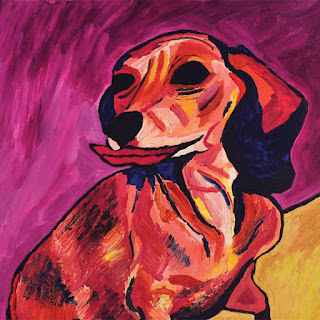 Great music, beer specials, a silent auction, a community canvas art project, and so much more. This is a don't miss event! I am working on getting a ton of new music added to my playlist - I may have to move some songs off of "Trending" playlist. That's never an easy decision for me to make. Anyway, let's dive right into to today's shuffle because time is tight! Well, first off, I have to say that night 2 of the Brian Wright and the Sneak-Ups Residency at The 5 Spot somehow manged to top the first week. Guest Audley Freed (The Black Crowes, etc.) sat in for a couple of songs - including a killer version of "Cortez the Killer". Brian Wright and his incredible band put on a great rock n roll show. From the exaltation of "Glory Hallelujah" to the emotional gut punch that is "Heavy Metal Shed Kids" - it was one of the best live shows I have experienced in a good while. Brian Wright has been a favorite of mind since I first heard his music. When he plays solo, it can be amazing. Full-band - it is something else entirely. 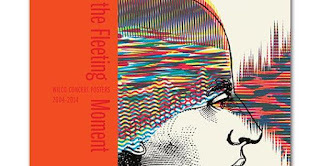 And this new band (Wade Cofer, Jon Latham, Matty Apples, Jimmy Matt Rowlan, Rob Crowell, Sally Jaye, and Kristen Englenz) is just out of this world. They still have two weeks to go, and I can wait to see where they take it from here. Next, more about the Magnolia Roads American Roots Hoedown IV. As if the music artists we've already mentioned were not enough, the nights will also include a community canvas and more. 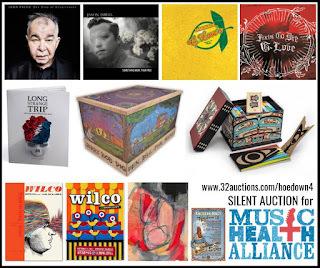 The silent auction, which I previously mentioned, and which benefits the Ben Eyestone Fund of the Musicians Health Alliance, is going to have many incredible items. The auction will be done all on-line - so even if you can't make it to the shows, you can still participate. I will be posting the links when they are available. One of the items comes from Wilco, an autographed poster book and more...signed poster, signed toy, scarf, bar towel, CD and pin. Now, let's get to today's shuffle. It is Wednesday, and I think this shuffle lives up to the "Wild" designation. Besides being wild, it is also filled with excellent music (both new and not as new). Let's go!